I was not sure that I would look at the temperatures of Rhode Island at this point, but with a hat-tip to Janet for the motivation, here they are. There are only 3 USHCN stations in Rhode Island - Block Island, Kingston and Providence, and so the loading of the data from the USHCN site goes very quickly. Chiefio’s list shows no GISS stations currently being used in the state. 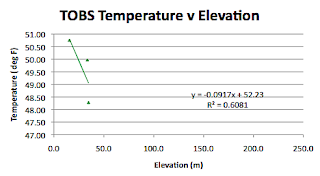 There is not that much one can do with just 3 points, but to be comprehensive, I will add the usual plots. With so little work being involved, I decided it might be an interesting exercise to implement a slight change in the way that I plot the data for the states. 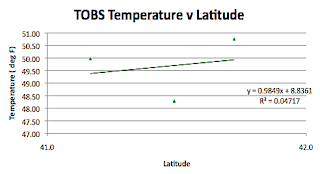 Because there is a clear relationship that has become evident between temperature and station latitude, elevation and population (and a dubious occasional one with longitude), I am, in future going to trying to use the state edges to define the scales on the plots, so that the location of the stations relative to the state average can be discerned. Because of changes in the relationships when the data is homogenized to give the USHCN mean temperatures I will continue to show the TOBS plots, since are likely to more accurately show the relationships to the station geographical conditions. I am using Netstate to provide this information. Rhode Island is the smallest state in the union, being 40 miles long and 30 miles wide. 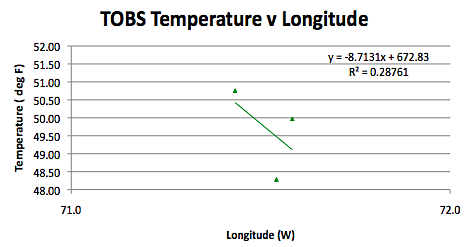 The Longitude runs from 71.13 W to 71.88 W, and Latitude runs from 41.3N to 42.002N. The land runs from sea level to 247 m, with an average elevation of 61 m (and all the stations are below this average). 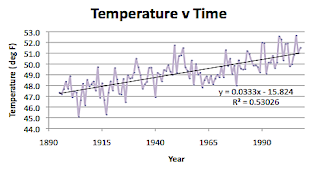 When one looks at the temperature rise for the state, bearing in mind that the stations are close to the sea, there has been a steady rise in temperature over the century. 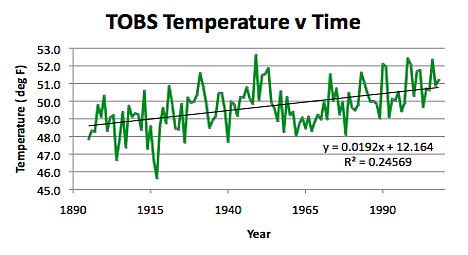 With the TOBS data this averages 1.9 degrees per century. 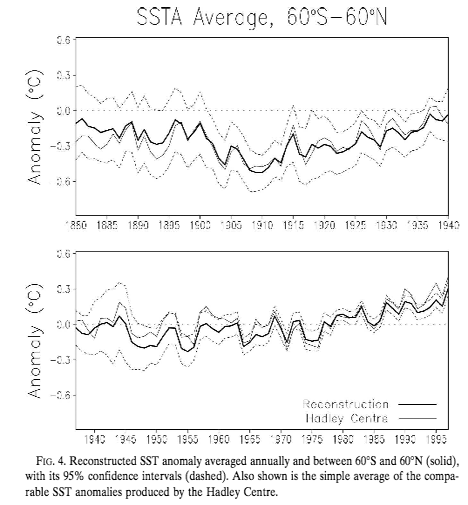 Note that the time period I am looking at is from 1895 and this was near the time that the average sst hit its low point, with the temperature rise since then having been around 1 degree C or 1.8 deg F, which is about the same as the raw data would suggest are seeing for the temperature change for Rhode Island. With that rough agreement it is interesting to note that the homogenized data for the three stations in Rhode Island show a temperature increase of 3.3 degrees. Note that this is not the TOBS, but rather the homogenized mean temps as adjusted for the different stations in the state. The overall elevation of the state, as I mentioned, in not that great, and averages 61 m.
And then looking at the correlation with population. Block Island is apparently only intermittently populated, so I gave it a population of 1. 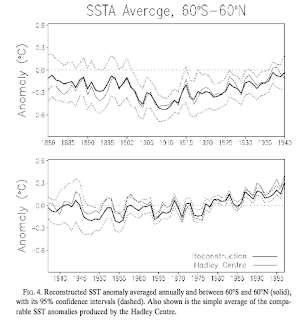 The small number of data points do not allow any confidence in any of the above correlations. They are of interest, even though small in number, because of the proximity of the stations to the sea. 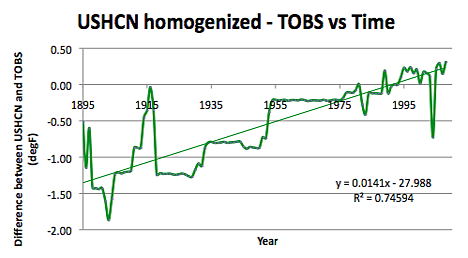 And as a final thought there is this, the difference between the adjusted USHCN mean values and the original Time of Observation corrected raw data. Looks like you have reached the point where it is no longer possible to "avert one's eyes" from the consistent observation that "homogenized" (adjusted by man) temperatures have been steadily increasing relative to "observed" (measured by equipment) temperatures. 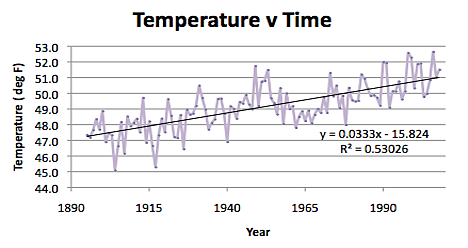 A logical next step would be to investigate the methodology of that human adjustment to measured temperatures.